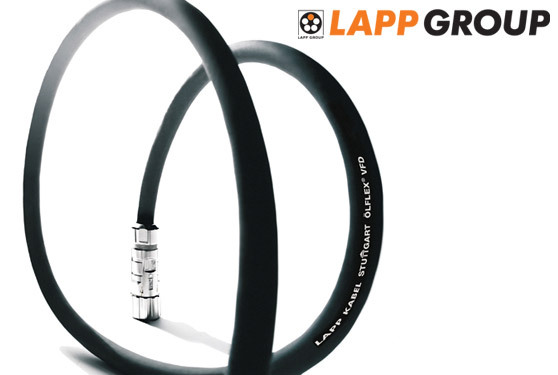 The Lapp Group's new ÖLFLEX® VFD 2XL, UL TC-ER rated motor cable is a robust, oil-resistant shielded design for use with variable frequency drives. Also available with a pair for brake or temperature, the ÖLFLEX® VFD 2XL comes with XLPE (plus) insulation and a phthalate-free TPE outer jacket that gives the cable maximum flexibility, low capacitance and flame-retardant properties. ÖLFLEX® VFD 2XL is dual rated for applications ranging from 600 to 2000 volts, which allows a single cable to serve in a wide range of applications. • Shielding includes barrier tape, triple layer foil tape and tinned copper braid. Ideal applications include VFD drive and motor connections for pumps, compressors, conveyors, elevators, extruders, pressers and HVAC especially in industrial environments. >> Click for detailed technical information.